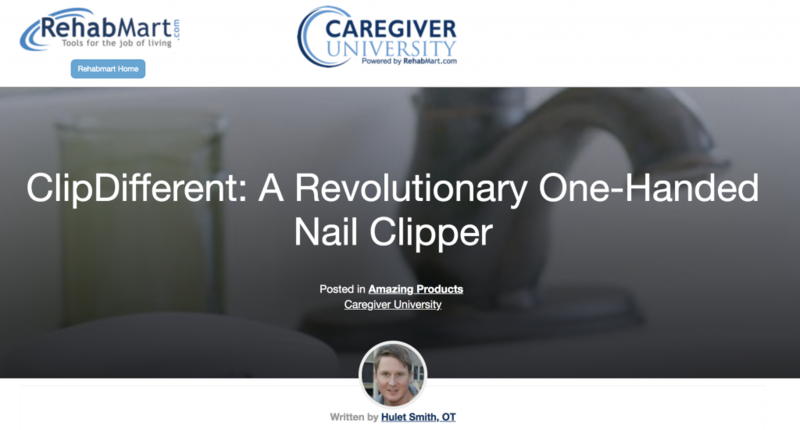 Hulet Smith, Occupational Therapist, reviewed and posted his findings on RehabMart/Caregiver Univesity using the One Hand Nail Clipper by ClipDifferent. RehabMart offers 9 different nail clippers for sale on their website. His review and highlight of the One Hand Nail Clipper by ClipDifferent sure captured the essence of the ClipDifferent experience by describing the Why, How, What, and Who very well. His hands-on experience resonated in this post. Have you ever considered the design of basic nail clippers? As a hygiene tool that’s been around for decades, its standard compound lever style hasn’t changed much. It’s still in use today because it works well for most people, enabling simple nail care. But, the ClipDifferent Pro Automatic Nail Clipper wasn’t designed for most people. As the inventor of this revolutionary new nail-clipping device, Tom McMullen Jr., explains, “We created it for those who need it the most.” As elegantly simple in its design as regular nail clippers, the ClipDifferent Pro helps people living with age-related weakness, low vision, and manual disabilities to clip their own nails safely and independently. The driving force and inspiration to create the ClipDifferent Pro were powered by McMullen’s lifelong sense of purpose and deep-rooted devotion to helping others – something he learned at an early age when his sister contracted polio. Witnessing first-hand her need for “extra abilities” to get through each day, McMullen developed a keen awareness for anyone who has to work harder to accomplish things the rest of us take for granted. That awareness sharpened later in McMullen’s life when his wife was diagnosed with progressive health issues, and he sought to make life easier for her. Some of the simplest daily tasks, such as clipping fingernails, became dangerous and nearly impossible to do by herself. Although there were some other adaptive nail clippers on the market, McMullen set to work on creating a better design, one that would be more inclusive for every type of user, including those with just one hand. After years in the making, the ClipDifferent Pro is the result. An exciting innovation that will change the way the world clips fingernails, the ClipDifferent Pro enables safe and independent personal care for everyone. Specifically designed to be simple and efficient, the automated ClipDifferent Pro employs patent-pending technology combined with countless hours of research, development, engineering, and testing. It easily trims fingernails without any danger of cutting the skin. Incredibly easy to use, the ClipDifferent Pro is a round, 5-inch diameter device with a non-skid base that sits on a surface, like a tabletop or bathroom sink counter. It is only 3-inches high, with a large flat area to place the finger and rest the hand. It highlights a slightly curved slot to place the fingernail into, with internal blade mechanisms to trim the nail as desired. A large, easy-to-push button turns the device on and off. The handy removable basket catches the trimmed nails for easy, no-mess disposal. It weighs only 14 ounces, so it’s easy to transport anywhere you need it. Quietly operating with an included AC adapter and a high-capacity rechargeable battery, the batteries will run on one charge for months of nail trimming dependability. As an activity that can often take quite a while to complete even for the most able-bodied user, trimming your nails with the ClipDifferent Pro will be complete in seconds, saving time, while simultaneously eliminating frustration and the risk of injury. Even though the ClipDifferent Pro Automatic Nail Clipper weighs less than a bottle of water, it is a finely-tuned, highly engineered, and durable piece of assistive equipment. Unlike most other adaptive nail clipping devices that still use the old compound lever mechanism which can also accidentally cut the skin, the Pro’s trimming blade is completely internalized. With the specially designed cut-out for the nail, it prevents the cutting mechanism from any contact with the skin of the finger itself. Additionally, the Pro can be used safely by just about anyone. While some other devices may be helpful for people with manual disabilities, they may not be as assistive for those with low vision, or may be difficult for users with one hand to operate. The ClipDifferent Pro, however, is safe for people who live with a wide range of disabilities, age-related weakness, and amputation. While many positive testimonials flow in from happy, fully-abled users, the ClipDifferent is making its biggest splash with seniors and the disabled community. There just hasn’t been anything like it, and people are loving the independence the Pro is bringing back to their lives. As one ClipDifferent Pro user said, “There is something about being able to do it for yourself that does make all the difference in the world.” This is a fact many living with age-related weakness or disability would agree with, and one of the best benefits of using the Pro nail clipper. Those with multiple sclerosis, Parkinson’s, fine motor disorders, ALS, manual disorders, neurological disorders, paralysis, and other issues affecting hand control, such as stroke recovery, or arthritis, can all gain a little more independence by being afforded the opportunity to safely cut their own nails. People living with low vision and even blindness can also safely use the ClipDifferent Pro, as can folks who have just one hand. The ClipDifferent Pro has revolutionized the nail clipper industry with its simple, elegant, and easy-to-use design. While it offers gentle and precise nail trimming, It will never cut the skin, and just about everyone can operate it, regardless of ability. Learn more about the revolutionary new ClipDifferent Pro Automatic Nail Clipper, and regain your independence with safely cutting your own fingernails! Hulet, Co-founder/CEO of Rehabmart, Pediatric Occupational Therapist, husband, and father. Passionate about connecting special needs kids with superb nutrition, sensory integration, and complementary health strategies. Excited about Rehabmart’s mission to become the premier online educational platform which empowers caregivers by spotlighting innovative devices and interventions to achieve optimal patient response and recovery. Learn more and support RehabMart on their website. Thank you Hulet for helping the community by sharing your expertise.